wow!!! im over here using 76561198361863267 instead of 110000117efe463 WOW! when did they change the using of dec to hex? never, it’s always been hex, at least fxserver afaik which is at least more than 1 year. Does the Smoke Grenade Launcher not work? Smoke grenade launcher? You mean the regular grenade launcher? Smoke grenade launcher is a bugged weapon and not included in vMenu. Is there a easy way to redesign this menu? No. You’ll have to completely start from scratch and make your own probably. Nope, there’s far too many vehicles for that. You can only limit them per category. For some reason, even though i am a “group.admin” i cannot spawn any of the vehicles i restricted. Do you know how to overcome this issue and allow all admins to use the restricted vehicles? 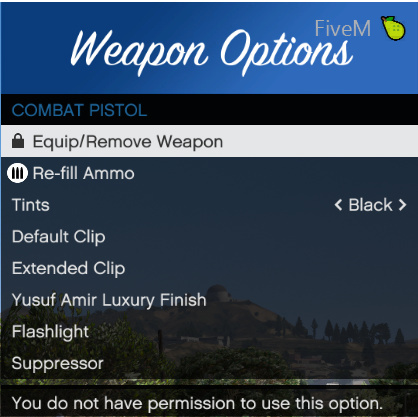 okay so i just noticed even tho i have them activated nobody can equip the a gun from the weapons menu it says they dont have permission heres some pictures of my perms and vmenu dispayed message. Did you use deny to deny them? In that case: no, not possible. It’s marked in a red warning box on the docs to never use deny. If you haven’t used deny, then you should be able to just give admins the permissions and you should be good to go. 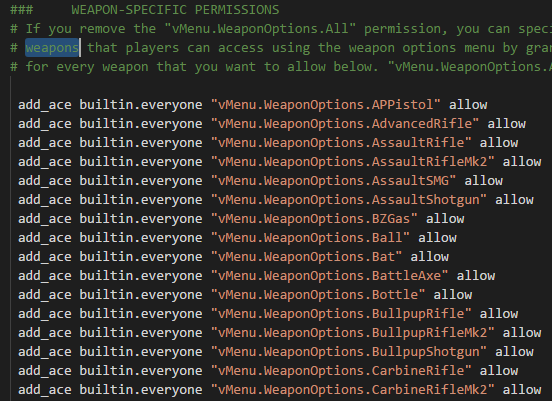 You’re not giving them the .Spawn permission, so yeah they’re allowed to edit those weapons you specified, but they won’t be able to spawn them until you give them access to spawn it. Hey Vespura, I’m vMenu and whenever I change the weather it’ll flicker to that weather then change back to clear, I have no other weather scripts in. I have no other weather scripts in. If it’s just flickering then it could be a graphics mod. If it’s not changing weather at all or constantly switching then you definitely have another sync script. There’s no other way. @Vespura I am trying to change the vmenu toggle key from M to F1. How do I change it? Ive already changed it in the config to 288 but it still stays on M for some reason. Please get back me to asap thanks! Is there a admin menu on this?? Not currently. Because your client no longer has control over the entity for things like that, the other client does whoever is currently driving it. And I’m not using any events to sync this, except for the kick from vehicle part. are the permissions actually executed correctly? You can make this menu staff-only yes.